I’ve been on a Middle Eastern food kick lately. I found myself longing for one of our favorite restaurants back home and I must’ve had it bad, because it informed half of our meals this week. Happy. Healthy. Life. posted a recipe for Curry Chickpea Cool Cucumber Wraps last week and the tahini cucumber salad reminded me of an impulse purchase I made a few weeks back. I’d been on a passive search for tahini, but finally decided to look up the Japanese word for it. For those not in the tahini fan club, it’s a paste made from sesame seeds. It’s kinda bitter on its own, but is the primary flavor in hummus and baba ganoush. Behold the power of sesame paste! NERIGOMA! Anyway, with Japan’s status as one of the world’s largest importers of sesame seeds, it seemed like tahini should be on the shelves. Turned out it is and with its very own Japanese name: nerigoma (練りごま). 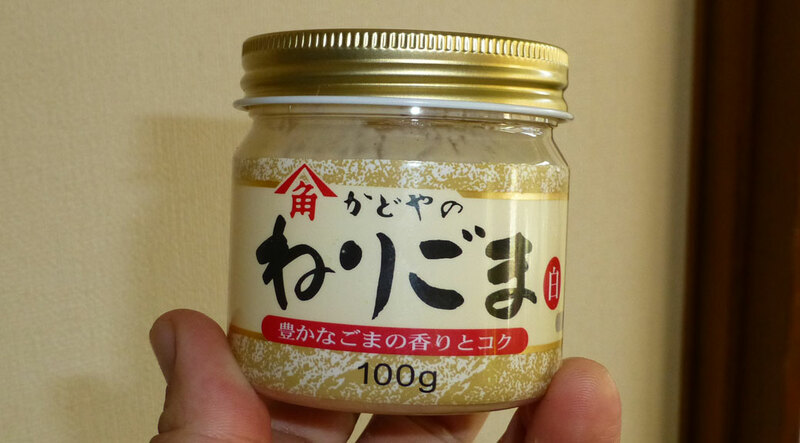 There were two options: the standard light-colored paste and (my impulse buy) a jar of black sesame seed paste. I justified this purchase by telling myself that, since dark-colored foods are good for you (it’s a real thing), I’d be doing a disservice NOT buying it. But what to do with it… ? I usually make hummus with garbanzo beans, but the idea to use the prevalent-in-Japan black soybeans (kuromame) popped into my head. Mix in the black nerigoma and we’re in superfood heaven! While a delicious meal, admittedly, it’s not the most photogenic meal. Usually bana ganoush and hummus have a lot of olive oil. I chose to omit those from my recipes since they add a LOT of extra calories. Frankly, I didn’t miss them. This was easily the simplest and best batch of baba ganoush I’ve ever made and the hummus is unique in a good way. I used Japanese eggplants, which are skinnier than your standard eggplant. They’re fairly easy to find in the U.S. nowadays and I think they work better for baba than your usual eggplant. I used nerigoma, but it’s roughly the same as tahini. The seeds used for nerigoma are toasted, which gives it a slightly different flavor, but tahini will probably be easier to find. Baba ganoush usually uses lemon juice, but I used a mix of lime juice and rice vinegar instead. This was just because I had those things in the fridge and hadn’t bought any lemons. I really like what it did to the flavor. The black soybeans were really dry, but I didn’t want to add copious amounts of oil and also didn’t want to neutralize the flavor with water, so I added the miso liquid to stay with the Japanese theme. You could use oil or add vegetable broth to get the consistency right. Tip: If using a blender, I suggest adding the wet ingredients to the jar first. It seems to help the beans work their way down to the blades. Puncture the eggplants several times with a fork. 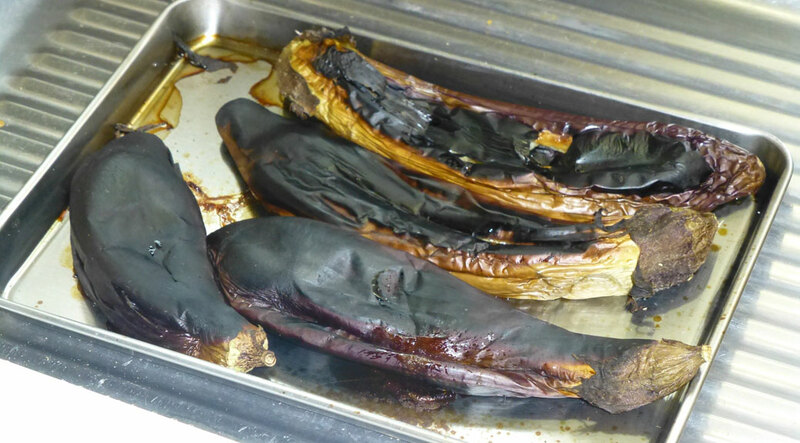 Put the eggplants under your oven’s broiler until the skin begins to blister and turn black, then flip and repeat on the other side. This takes anywhere from 7-10 minutes. The skin should be charred and the inside of the eggplant should be soft. While the eggplants are cooling, peel the garlic, chop the parsley and set up your blender or food processor. Peel the eggplants. The best way I’ve found is to slice the eggplant down the middle, then take the flat edge of a knife and scrap the flesh off the skin. Make sure the skin is completely removed as the texture can be unpleasant. Put the eggplant flesh in the blender. Add the garlic cloves, sesame paste, lime juice, rice vinegar, cumin and salt. Chill for at least an hour before serving. Serve with fresh parsley garnished on top. You may also choose to drizzle olive oil on the top for added richness. If you’re using dried soybeans, soak them overnight. Then put in a saucepan, cover with 1-2 inches of water and bring to a boil. Turn down to a simmer and cook until they reach the soft side of tender. Set up your blender or food processor. Add the garlic, sesame paste, lemon juice and a couple tablespoons of the miso liquid to the blender. Add the soybeans, cumin and salt. Blend until smooth. Add miso liquid 1 tablespoon at a time if the mixture is too dry until it reaches the desired consistency. Chill for at least an hour before serving. Like the baba ganoush, you may choose to add extra virgin olive oil prior to serving. What a great post! I just followed you to stay updated on your future posts and I look forward to them. I just started my own vegetarian/political blog, so feel free to check it out and let me know what you think!